Good Lord, FFG be keepin' a brotha busy huh? 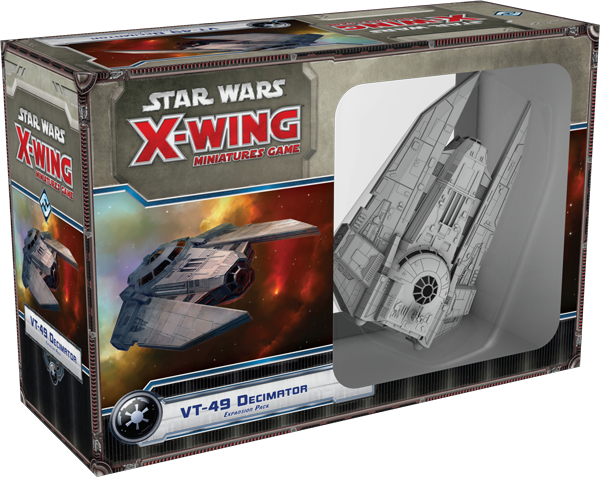 Yesterday, around lunch time FFG revealed some more info regarding the YT-2400, then later in the afternoon, around the time I was working on and subsequently burning myself on a hot melt machine at work, they went and dropped a second reveal on the Decimator! So we already know a fair amount about the Outrider, the main things revealed today were a heretofore unknown Elite Pilot Skill card called Lone Wolf and the other Named Pilots besides Dash Rendar. If you were on the fence about buying a YT-2400 because it might be too much like the Falcon and you don't really fly the Falcon too much anymore because some hipsters made fun of you for flying it too much back in the day, and well, you don't like being made fun of like that, guess what? This card alone is pretty much worth the price of admission. First it's dotted, which is a good ah-HEM-damn thing because if it wasn't, everybody would be sporting one. For only two points, if you're sad and if you're lonely, and you haven't got a friend, just remember that you can reroll 1 of your blanks whether you're Attacking or Defending. How friggin' awesome is that? 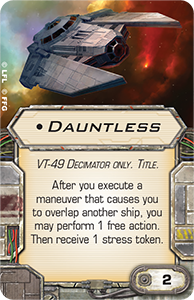 Admittedly, this card will take some time to find a home- it's basically anti-TIE Swarm and basically anti-Biggs fill-in-the-blank, but holy mackerel, it's pretty sweet. The obvious application is on TIE Phantoms as they move so herky-jerky they're hard to fly effectively in a formation anyway, but this would work well on anybody who can generally take care of themselves, but sometimes hangs around the rest of the crew anyway. 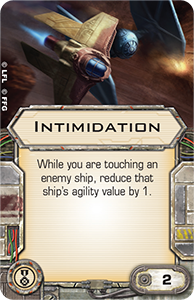 There's so many pilots out there now I hesitate to be all, "It'd be good on this guy", but the ship that mainly comes to mind when I think about this card? A-Wings. 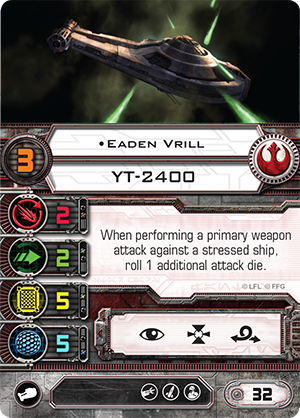 I think a lot of people have A-Wings picking off the wounded gazelles and this card makes even a Green Squadron really, really tough to hit and maximizes their attack potential for no cost, i.e. not an Action, other than points. Note too that it works on anything- Primaries or Secondaries. Awesome. 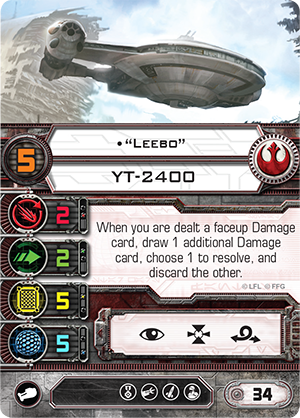 As for the named Outrider pilots, we've got Leebo (not to be confused with Deebo) and Eaden Vrill. Ok, so that's cool- when your opponent Crits you, you draw 2 cards and choose which one to resolve. I mean, you still get stuck with a Crit, but it's the devil you know and all. The ability isn't that great, but notice that you do end up with a PS 5 Outrider that can take an Elite Pilot Skill. That in and of itself is potentially worth something. This is potentially an even bigger deal. Remember Sean's article about Stress Relief a week or so ago and how we started talking about how the weaponization of Stress is kind of interesting? This guy totally plays off of that notion in spades because he's PS3 and will be firing after lots of folks voluntarily invoke Stress! With a Primary that can fire outside the firing arc lines! In a ship with 5 Shields, 5 Hull, and a 2 Agility! He's not cheap, but man, in the right list this guy could be really tough on opponents. The Decimator we haven't had much stuff revealed, officially anyway. You might have seen over the weekend some screen caps (probably from the print copy of GTM) making the rounds on the internet that revealed a couple of cards for the Deci- I have no idea if the second half of today's double-header was a reponse to that or was planned all along, but regardless, we had that leaked info officially revealed. 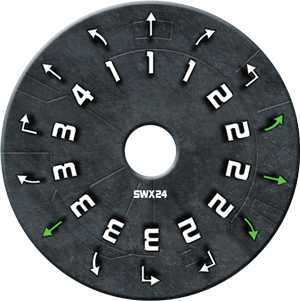 First and foremost, we got the Decimator's dial shown to us for the first time. Take that in for a second. No there's no red maneuvers and there's no K-Turn. I'm going to say, "So what?" to that nonsense. It's got three Speed 1 maneuvers, every Speed 2 maneuver, every Speed 3 maneuver, and a straight 4. Couple that up with it's 3 Attack Primary Turret, and big base and you've got a very user-friendly ship on the surface. Dig on that for a second too- this guy damages ships that he runs into. He's driving a big base ship with the moves I already described above. This thing oughta come with the Ben Hur soundtrack cause there's gonna be a whole lotta ramming speed going on. 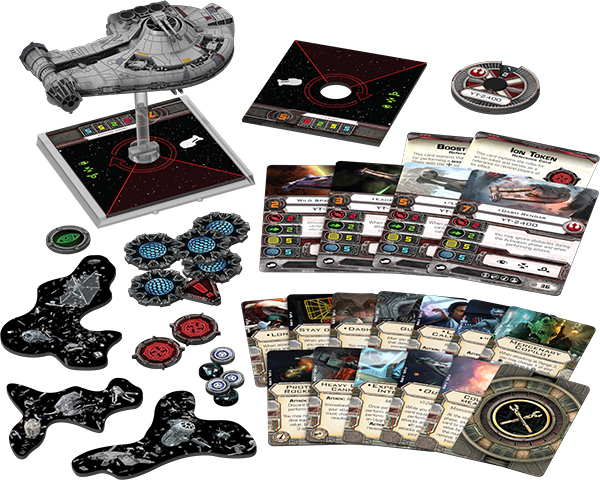 Also note this is probably another thinly veiled attempt by FFG to kill low PS generic ship/ swarm meta. He's PS 4, so he's going to move after all the lower PS ships move, but his card text will basically have no effect on anybody ramming him later in the Activation Phase. Unless you put Anti-Pursuit Lasers on him, of course. There's also this little gem, but honestly, I don't know that you actually need it. 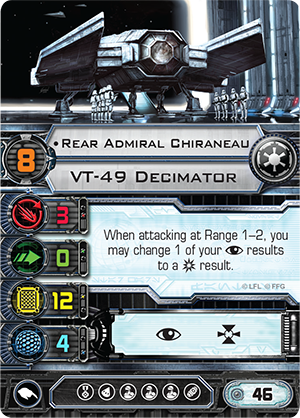 Notice that this thing is kinda like Etahn A'Baht's ability in that those lowered Agility values transfer to the rest of your squadron's shooting. So basically, drive the Deci into the middle of your opponent's formation then blast away. 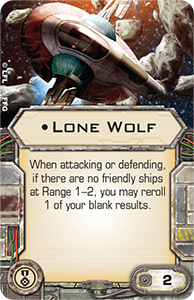 Again- do we need anymore proof that FFG is trying to actively balance this game so that non-Swarms have a shot? Come to think of it, I think we'd already seen the Rear Admiral (huh, huh, huh you said rear), but Kenkirk is new. Not sure how much of a difference getting a 1 Agility really gets you at that point over the guided missile of blunt force trauma that is Captain Oicunn, but there ya go. I guess when you take into account the Deci only has 4 Shields, you probably would get a lot of mileage out of that card. Nevermind. There are a handful of other upgrades and whatnot that were revealed today. 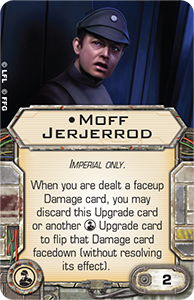 While I'm sure you could find some uses for Jerjerrod on a Shuttle or Firespray, he's great on a Decimator because it's almost assuredly going to take some crits. Note that you can choose to jettison Jerjerrod or another Crew member when you want- it's not like the first crit you get you have to actually use him. If you get something that doesn't really interrupt your game plan, you can take that one and sit on Jerjerrod until you get a Direct Hit dealt to you or whatever. That's pretty contextual and you know how I love context. Eddie Izzard seems like a good fit on that Kenkirk version of the Decimator. At a glance she seems like a pretty expensive upgrade going onto an already pretty expensive ship, but I could see it working. 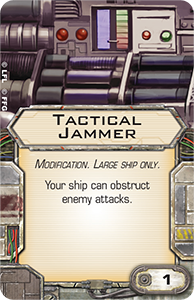 Honestly, I think if you feel like you can get by without a Gunner, this card might just work best on a Firespray. It's kinda funny to me that this card turns up immediately after they debuted a new guy who can effectively render this card useless, but there ya go. It is pretty sweet, really and Rendar, Crew Member is only going to buff the ship he's actually on, so even if your opponent takes it, it's still worthwhile. 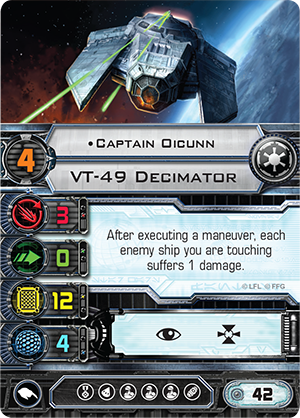 Again, if you're buying into the Captain Oicunn ramming speed idea, this card is a great one if you can't find the points for APLs as it'll likely be out front and center of whatever else you're flying. 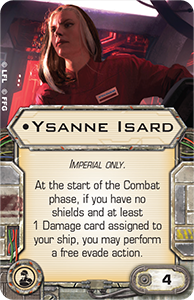 I got majorly sidetracked when I saw this card because it made me think of Adrianne Curry as the Imperial Officer, which subsequently made me think of Adrianne Curry as Leia in the metal bikini, which also subsequently made me think of Adrianne Curry as Aeon Flux. 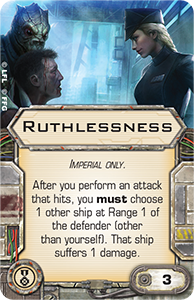 Anyway, Ruthlessness is another one of those anti-area of effect type cards, but this one is kind of interesting in that it's just an Imperial only Elite Pilot Skill. Do your buddies take Biggs all the time? Well, here's the kryptonite for that. Admittedly, it's not totally cheap and you need to watch it as Ruthlessness must hurt somebody at Range 1 if your Attack actually Hits, but it's hard to debate its usefulness against opponents who favor formations. Also dig on the fact that it's not dotted. 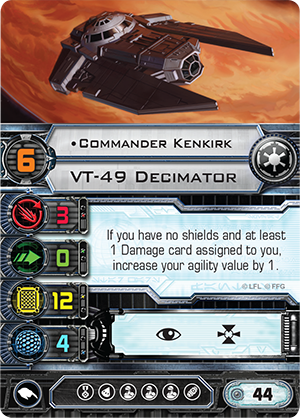 While multiple 18 point Black Squadron Pilots might not sound like the brightest idea on paper, the collateral damage this card causes certainly does make a case for it, no? Long story already long, I really like how these ships change the game. You know that I'm kind of a sucker for trying new stuff and all that, many of these cards that have been recently revealed have the potential to disrupt the dominant meta and really put the match result back into the hands of the guy who can fly his list better, which I think is really cool. It's commendable to me how they've done it without totally destroying the groundwork they've put down up to this point too, y'know? I mean sure, if you think formations are the only way to play this game, you probably don't share that opinion, but after all of this evens out in the long run, I think most folks will be building their lists around what they actually want to play rather than what they feel like they have to bring to be competitive. And again, not all of y'all may agree with me when I say it, but I think that's awesome.